Are You Overwhelmed with Running Your Business? Running a business can be very demanding. It can sometimes be difficult for a business owner to get ahead. Often times they could use an extra set of hands but can’t really afford to hire an employee. Do you feel like you’re drowning in paperwork and small office duties such as tax filing, bookkeeping, email management and marketing ? Many small business owners feel that they spend so much time trying to catch up with their office tasks that they never have time to actually improve their business making it easy to want to throw in the towel. Even worse, this is the reason why some people give up on potentially profitable ideas, because they never get the chance to explore the true profitability of an idea. However, if you find yourself in the same position you may want to reconsider giving up on your business altogether, because it may be possible to enhance your business at a fairly inexpensive rate. 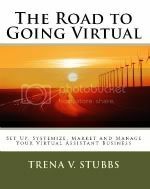 While hiring an employee may seem out of the question, the virtual world provides a solution in the form of a virtual assistant. A virtual assistant can be hired on as an independent contractor freeing you from employee laws, taxes, and providing benefits such as health insurance etc. Additionally, since you do not have to pay a weekly salary you can hire them when you need aid and assign projects as you can afford them. You only pay for the service when you need it. In return, you can receive much needed aid with your admistrative work, bookkeeping, website maintenance, marketing, or any other area that you spend too much time on. This way they can complete the much needed tasks while you are free to explore expansion and production ideas that will increase your productivity and profitability.